Our American Buffalo heard was brought to the farm because of the love I have for this great animal. Our family has been farming for centuries in both crops and animals. Today we have 19 of the most wonderful Bison. Tacoma is our 14-year-old bull, who stands over six feet tall and weighs in at nearly 3,600 pounds. 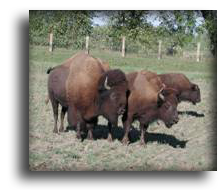 To keep Tacoma company we have on staff 13 females (that is 13 Bison females) all trying to win his love and attention. 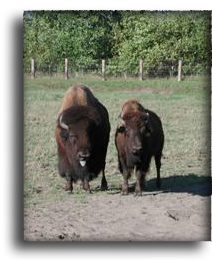 We also have the only DNA tested and certified by The National Bison Association identical twins name Wange and Nepa. All 19 Buffalo have come to the farm and enjoy having visitors to see and take pictures of them. If you would like more information please call 616-399-1900. 1. Sear the outside quickly and reduce heat when flipping to the second side. 2. Remember there is very little fat in "Good bison meat". This mean's you must run a lower heat and flip more often (I flip every 5 to 7 minutes). By doing this you cook deeper into the meat with less stress to the outside. 3. A well-done style of meat is soft pink, Never cook bison to a gray inside color!!! Bison can progress a full level (medium-rare to medium) after cooking as it cools. 4.Plan on trying to cook Bison once or twice before cooking for friends & guests. Warning: Once you start eating Bison it will become a part of your weekly menu. I have yet to find a child that doesn't love it, just have them try it before you tell them its Buffalo.